Steve Carlton, best remembered for his time with the Philadelphia Phillies, pitched for nearly a quarter of a century and was one of the last great workhorse pitchers known for their power and control. 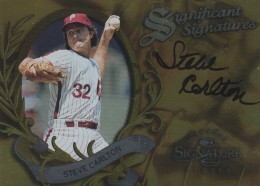 This top list documents the key Steve Carlton baseball card appearances from his long and storied career. 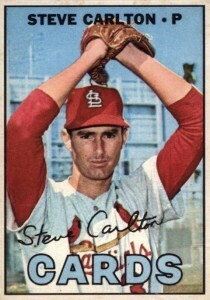 Shop for Professionally Graded Steve Carlton Cards on eBay. Carlton was a tall and strong pitcher given the nickname "Lefty" as he was a southpaw. He debuted in 1965 and spent his first seven seasons with the St. Louis Cardinals and, along with Bob Gibson, made up a dominate pitching duo. After the 1971 season, Carlton was traded to the Phillies in what has become known as one of the most lopsided trades in MLB history. The very next season, Carlton had arguably the best year ever for a pitcher on a terrible team. He won 27 games and was unanimously chosen as the Cy Young Award winner for a Phillies team that only won 59 total games the entire season. Steve Carlton would win a total of four Cy Young awards while with the Phillies, becoming the first pitcher to reach that amount. In many ways he was the last pitcher of a certain mold that no longer exists in baseball today. Carlton was the most recent pitcher to win 25 or more victories in the National League and the last pitcher to hurl 300 innings in a season. By the end of his career, he had notched 329 victories and more than 4,000 strikeouts, placing him second all-time for left-handed pitchers. 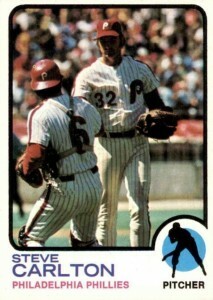 He also had two World Series titles, including one with the Cardinals in 1967 and one with the Phillies in 1980. With these credentials, his election to the Hall of Fame on the first ballot in 1994 was assured. Although Carlton is best remembered for his time with the Phillies and Cardinals, he also pitched briefly for the San Francisco Giants, Chicago White Sox, Cleveland Indians, and Minnesota Twins, and collectors can find cards (and sometimes relics) from each of those stops. In 2005 Upper Deck Heroes, a relic features Carlton as a Giant and 2004 Leaf Certified includes a relic from his time with the White Sox. Indians fans can find Carlton included in 1987 Topps Traded and one of Carlton's final cards features him as a Twin in 1988 Fleer. In 1984, the Star Co. card company issued a career retrospective set devoted completely to Carlton, covering both his Cardinals and Phillies years. In 2014 Topps Supreme, Phillies fans can also find a dual autograph card featuring Carlton and teammate Mike Schmidt. Because Steve Carlton's career spanned 24 seasons and hundreds of baseball cards, there quite a large number of choices available to collectors. In building this list, card value was used as a major component along with design and each card's desirability to collectors. Although the size of 1973 Kellogg's Pro Super Stars is similar to the other Kellogg's sets of the time, it differs in that it was not done in the three-dimensional style that collectors were accustomed to seeing. The 3-D printing has proven to lead to card damage over time and so the 1973 set offers an alternative that won't bend or crack over time. Carlton's card highlights his amazing 1972 season when he won the pitching Triple Crown (leading the league in wins, strikeouts, and ERA) as well as several other pitching categories. 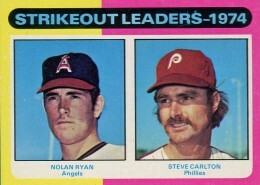 Carlton and Nolan Ryan were the strikeout kings of their era and both frequently led the American and National League in that category. 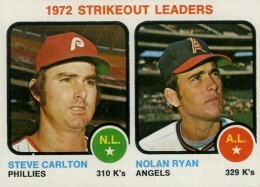 The two players share cards honoring that fact in 1973 and 1975 Topps. Later in their career, both players would take turns going back and forth becoming the all-time strikeout leader for a limited time until the other player would surpass him. This feat is also memorialized on a card in the 1984 Topps set featuring Carlton, Ryan, and Tom Seaver. 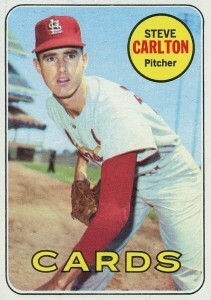 On the reverse side of Carlton's 1969 Topps card it mentions that he pitched a one-hitter during the 1968 season. Although Carlton would never notch a perfect game or no-hitter, he had an amazing total of six one-hit games, tying him for the third-most all-time. 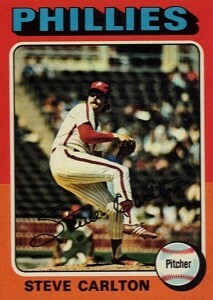 Carlton's 1975 Topps card is one of the best action photos from the set. It shows him in the middle of his pitching motion and gives you an idea of the imposing presence he had on the mound. The viewer can't help but also notice that there are a lot of empty seats behind him as he hurls his pitch. When you track down this card, be sure to also pick up the mini version as well. Carlton's 1973 Topps card was his first regular-issue Topps card with the Phillies and it includes a nice action photo of the team's catcher Tim McCarver handing the ball to Carlton while he is on the mound. The reverse side details Carlton's historic 1972 season. Steve Carlton is all smiles on his 1968 Topps card but it wouldn't always be that way, especially given his relationship with the baseball media. For many years, Carlton refused to answer any questions from the media after they criticized his unorthodox training techniques that included martial arts workouts. It is rare that one of most popular cards for a Hall of Fame comes seven years after his rookie debut. 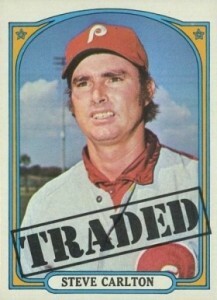 Carlton's career exploded and he became a superstar after being traded to the Phillies in early 1972 and he was included in the 1972 Topps Traded set. 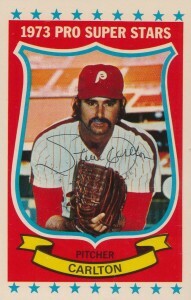 This first appearance for Philadelphia makes it one of his most popular cards of his career. Along with many other great veteran players, the Significant Signatures insert series from 1997 Donruss Signature was Carlton's first certified autograph. Each shiny foil card features an on-card autograph and each entry in the 22-card series was numbered to 2,000 copies. Carlton wasn't included in the 1966 Topps set and budget-minded collectors must look to 1967 Topps to find an early Carlton card as an alternative to his pricey rookie. 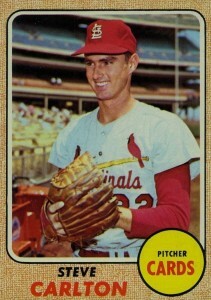 The 1967 season would prove to be Carlton's first good season and he finished 14-9 with a 2.98 ERA. By far Carlton's most popular card on auction sites, his 1965 Topps rookie is also the premiere rookie in the entire 1965 set. 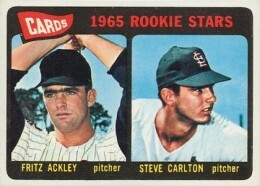 Steve Carlton shares his rookie with Fritz Ackley, who would pitch in just five major league games and finished his career with a perfect 1-0 record. The coloring on the card makes Carlton's cap look almost black rather than the Cardinal red. Near-mint copies at auction can reach over $300 and mint copies can attain prices that are three times as high. 2018 Topps On-demand Dynamic Duals Rollie Fingers Steve Carlton HOF Auto SP!